Dolly Parton performs "It's All Wrong, But It's All Right"
"It's All Wrong, But It's All Right" is a song written and recorded by American entertainer Dolly Parton. It was released in March 1978 as the second single from the album Here You Come Again. 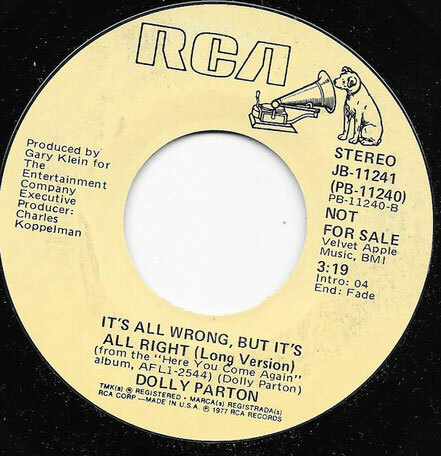 "It's All Wrong, But It's All Right" was Parton's seventh number one country single as a solo artist. The single stayed at number one for two weeks and spent a total of ten weeks on the country chart.The song was part of a double-A-sided single, "Two Doors Down"/"It's All Wrong, But It's All Right", and while "It's All Wrong, But It's All Right" was topping the country singles charts, "Two Doors Down" had been released to pop radio, where it would reach the top 20 on the U.S. Hot 100. Hello are you free tonight? Could I use you for a while? Is it okay if I stop by?